Mumbai, India & Dublin, Ireland; 28th March 2017: Indians are amongst the world leaders in terms of internet usage from mobile phones, according to StatCounter, the independent web analytics company. Its research arm StatCounter Global Stats finds that 79% of internet usage was made by Indians through mobiles in February compared to 49.7% for the world in general. Indian mobile usage to surf the internet is more than double that in the UK (34.8%) or US (37.2%). 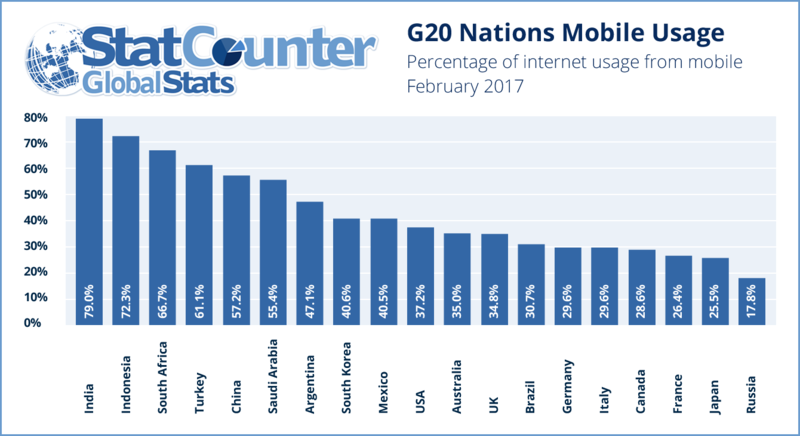 Of G20 nations, India is the number one user of mobile in terms of internet usage. StatCounter is one of the leading web analytics firms in the world with a considerable market share in India. StatCounter’s (http://statcounter.com) core business is to provide members with data to measure visitor activity on their website, blog or forum. Key features include a free option, ease of use, independence and ability to view data in real time. Desai said that the move by new player Reliance JIO with over a 100 million subscribers to offer free 4G data (1GB per day limit) over the last six months until April 1st was probably one but not the only reason for the acceleration in mobile internet usage in India. The most popular browser in India in terms of internet usage according to StatCounter is UC Browser (43.3%) followed by Chrome (36.1%). This compares to worldwide, where Chrome (52.4%) leads the way followed by Safari (14.4%). Reflecting the strong mobile preference, the top operating system in India across all platforms is Android on 62% followed by Windows (19.4%). Worldwide, Windows leads on 38.6% followed by Android (37.4%) and iOS (13%). When it comes to search, however, Indians behave similarly to the rest of the world. Google on 93.4% is the dominant player in India, little different to worldwide (92.4%) or UK (91.1%).